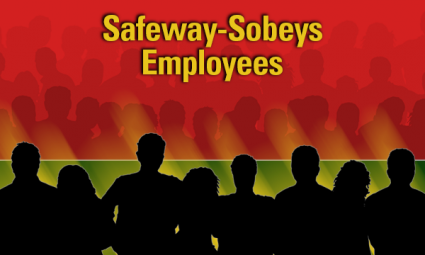 While the negotiating committee entered into its first round of meetings with Safeway/Sobeys in January with cautious optimism following productive meetings in November, that optimism was short lived. The negotiating committee worked hard the first two days of negotiations to review and remit a full response to all Union and Company non-monetary and monetary proposals. However, the Company failed to make a similar effort and left the negotiating committee with little to consider. Having said that, your committee still persevered to present positions on your behalf. The Company’s proposals, which they believed would move bargaining along, sought only to unfairly strengthen their own positions and offered nothing of reasonable value in return to you the members. Useful negotiations can only take place where both parties are willing to engage in real give and take with a sense of equality and good faith. Safeway/Sobeys demonstrated last week that they are not willing to do their part in that regard. The major concessions are still on the table that will affect all members and their hours of work (Ie. Department Managers out of the bargaining unit and ten major vendors to do bargaining unit work). But the Company’s concessions are not limited to just these two proposals. Therefore, your Union has applied for mediation and the Mediator will be present at the next round of negotiations taking place in Calgary on January 19-23 at the Holiday Inn Express at 45 Hopewell Way NE. Your bargaining committee will continue to work diligently to achieve the best Collective Agreement possible for you the members! If the Company does not change their bargaining position quickly, we will ask the Mediator to write out. Then we will be taking a strike vote, so please plan for the worst and hope for the best. Remember you are the Union and what makes this Union STRONG!! !